- I dedicate this victory to my former teammate Michele Scarponi. Yesterday I spoke with his widow at the start, and it inspired me even more, to go for a stage win in the race that Michele loved to ride. The team worked very well today, everyone within the team is in great shape so far during this season. It’s great to experience all this success, everything comes together during the past few months. Two years ago, around this time, we didn’t win once. Now have nineteen victories. It’s amazing, but we will see if we can keep performing like this during the rest of the season. Today, when the team did a great effort by closing the gap with the break, I tried to save as much energy as possible. On the final climb of the local lap, with one more lap to go, I knew it was my time to attack. I knew everyone had to work very hard to keep the wheel of Alexey Lutsenko and Dario Cataldo, and I benefit from that right at the top of the climb. I’m really happy with this win, and for sure I will try to keep the podium, - said Jakob Fuglsang. 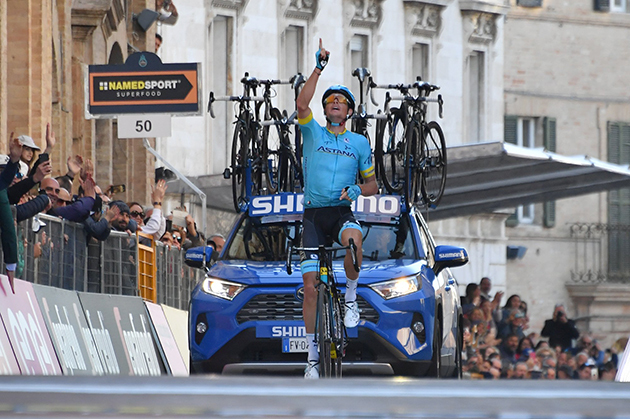 Jakob Fuglsang wins in Italy. Sirotti photo. - This was the classical stage of the Paris-Nice and we knew pretty well the attacks and breakaways could bring success. So we had a good plan to animate the race from the start. Finally, I was able to go in the break together with my teammates, Luis Leon, Miguel Angel, and Hugo. Indeed, it was a great day for us, we wanted to improve the position of Luis Leon in the general classification but also to fight for the stage. I felt good during the whole day and in a moment when I say a possibility I attacked. I was able to get a gap and continued pushing the pedals until the finish. I am super happy with my win, I wanted to win this stage so badly! I think we did a strong race here at the Paris-Nice with the victories of Magnus Cort and mine. I know that in the same moment Jakob Fuglsang took a win at the Tirreno-Adriatico, so I congratulate him as well! What a team we have! It is so great,- said Ion Izagirre. Ion Izaguirre wins in France. - It is a great end of this week! Our team is looking strong in both races, at both Paris-Nice and Tirreno-Adriatico. This is the true result of the hard work, which the team did during the off-season. Now, all that work pays off. I saw a very united team with a great atmosphere in France and in Italy during my visits this week. This is the key to our success. I congratulate Ion Izagirre on his beautiful victory today in Nice and at the same time, I am super happy for Jakob Fuglsang, who scored an impressive win at Tirreno. I want to thank all our sponsors and partners, who support us and make this possible!- said General Manager Alexandr Vinokurov. In Tirreno-Adriatico, the riders started in Colli al Metauro to finish in Recanati after 180 kilometers of racing with multiple challenging climbs in the final part of the race. A breakaway of ten riders formed early in the race, but when the race entered the local laps, only a few riders of this group remained. The riders of Astana Pro Team started chasing at the front of a reduced peloton, and when Dario Cataldo finished pulling, Jakob Fuglsang took off. He managed to close the gap with two remaining riders of the break, but with 13 kilometers to go he went solo and took the stage win with an impressive solo attack. Adam Yates finished second, retaining his race lead, Primoz Roglic was third. 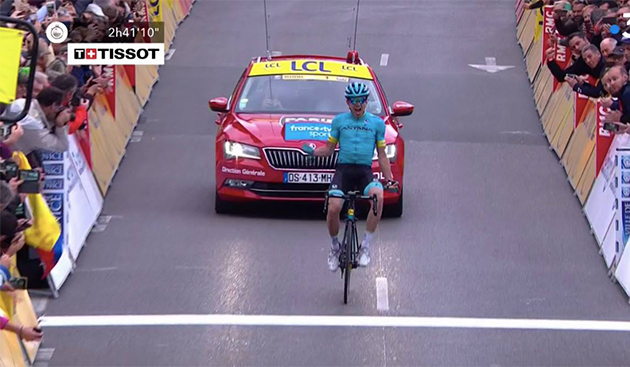 With two stages to go, a relatively flat stage and an ITT, Jakob Fuglsang is third on 35 seconds of Adam Yates and 10 seconds on Primoz Roglic. Tomorrow, the riders start from Matelica to finish in Jesi after 195 kilometers. In Paris-Nice, the start and finish were in the city center of Nice. The stage of 110 kilometers was characterized by 6 hard climbs. The race exploded immediately after the start with many attacks. Finally, a group of 40 riders went away with a gap of 2 minutes over the peloton with 4 Astana Pro Team riders there: Ion Izagirre, Luis Leon Sanchez, Miguel Angel Lopez, and Hugo Houle. That leading group reduced heavily on the climbs, while later one of the GC contenders, Nairo Quintana, joined the leaders after his decisive move from the peloton. Hugo Houle and Miguel Angel Lopez worked hard for Luis Leon Sanchez and Ion Izagirre, to give their teammates a chance to stay clear in the front. Ion Izagirre attacked inside the final 15 kilometers and with this solo, he took the stage 8 win. In the tough battle for the general classification, the Colombian Egan Bernal was able to protect his lead, thus winning the race. Nairo Quintana is second, Michal Kwiatkowski third. Luis Leon Sanchez was able to move up to the 9th place in the final overall standings after today’s stage. Egan Bernal became the fifth different Team Sky rider to win Paris-Nice after successfully defending his overall lead on an exhilarating final stage of the ‘Race to the Sun’. Egan Bernal gets to take the yellow jersey home. Bernal came under attack from a host of General Classification riders on the short 110km test around Nice, with compatriot Nairo Quintana the main threat. However, Bernal’s teammates rallied around him to bring an elite breakaway containing Quintana to heel, which at one point had a large enough advantage to land the Movistar man the yellow jersey, to ensure Bernal won the race, and Michal Kwiatkowski finished third. Bernal was also the best young rider, Kwiatkowski secured the green jersey for best sprinter and Team Sky topped the team classification to round off an emphatic performance. The stage started with a large attack with several GC threats present, meaning Team Sky had to work on the front of the peloton from the opening kilometres to keep the group within striking distance. Ilnur Zakarin (Katusha-Alpecin) was the biggest threat to Bernal's yellow jersey at this point, but as the break's numbers - that had swelled to 39 at one point, starting to dwindle, Quintana attacked with 47km remaining. This is where Bernal's teammates worked tirelessly to reel the break in and when eventual stage winner Ion Izagirre (Astana) attacked from the Quintana group on the final climb, it seemed to disturb their rhythm, allowing Kwiatkowski to bring Bernal back to finish in the top 20 and seal a sixth Paris-Nice title for Team Sky. “I can’t believe that I just won Paris-Nice. It’s incredible for me. I’m really happy. I... I just can’t believe it yet. “When some GC riders started to attack I knew I could follow them, but also I know that I have a really good, strong team, and my team can control these races. So it wasn’t too difficult to be calm because I really believe in my team. They did a really, really good job. We knew it was the last day so they pulled really hard. “Nairo was really strong but I had a really good team - Kwiato, Sosa, Tao. When Quintana attacked I thought if I followed then after I may be alone. I preferred to wait a little bit, stay calm." Thomas De Gendt secured his polka dot jersey in the closing stage of Paris-Nice today. The Lotto Soudal rider took some additional points on the first two ascents of the day and that way, he was sure of winning the mountain classification. It is the third polka dot jersey that the Lotto Soudal rider gets to take home in the Race to the Sun after earlier ones in 2015 and 2018. Ion Izagirre won the final stage while Egan Bernal held on to his yellow jersey. De Gendt started the short but action-packed stage with an advantage of 21 points over his main rival De Marchi. Almost immediately after the start, the roads started to rise as the riders had to conquer six climbs in the area of Nice. De Gendt was first to cross the Côte de Levens, the first climb of the day. The Lotto Soudal rider earned another five points atop the second hill and as De Marchi gave up the fight, De Gendt could secure his third Paris-Nice polka dot jersey only moments later. The first 90km of today’s 180km stage were fairly flat, but this was just the calm before the storm – the remainder of the day was relentlessly undulating. The day’s four categorised climbs were just the tip of the iceberg as the other ascents, while uncategorised, were brutal. Over the course of the day, riders would have to contend with climbs of up to 20% - more than living up to their reputations as being wall-like. 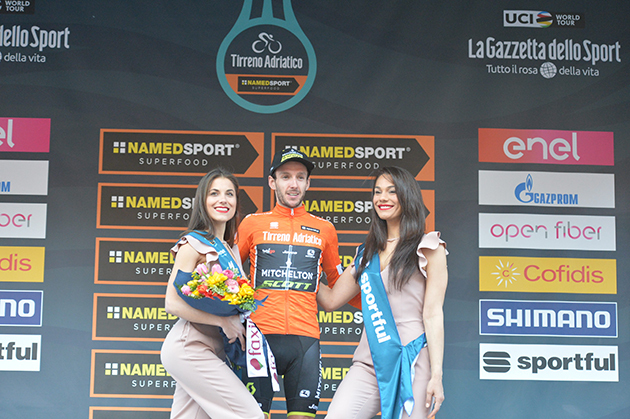 Adam Yates remains the Tirreno-Adriatico GC leader. Sirotti photo. On such a difficult day, few would want to try their luck in the escape, but BORA-hansgrohe’s Daniel Oss was more than up to the task, jumping in a group of thirteen and helping them to build a lead of a little under ten minutes. As the climbing started, the break became more strung out, often regrouping on the descents before breaking up on the climbs. Eventually a group of four broke off the front with around 40km remaining, but with the peloton upping the pace, it was uncertain whether the break would last to the end of the day. A solo attack from this lead group determined the day’s outcome, taking off on their own in the final 10km and holding the chasers at bay to claim the stage. First across the line for BORA-hansgrohe was Davide Formolo, a little over three minutes after the stage winner, as the team prepared for a tough day on tomorrow’s penultimate stage.